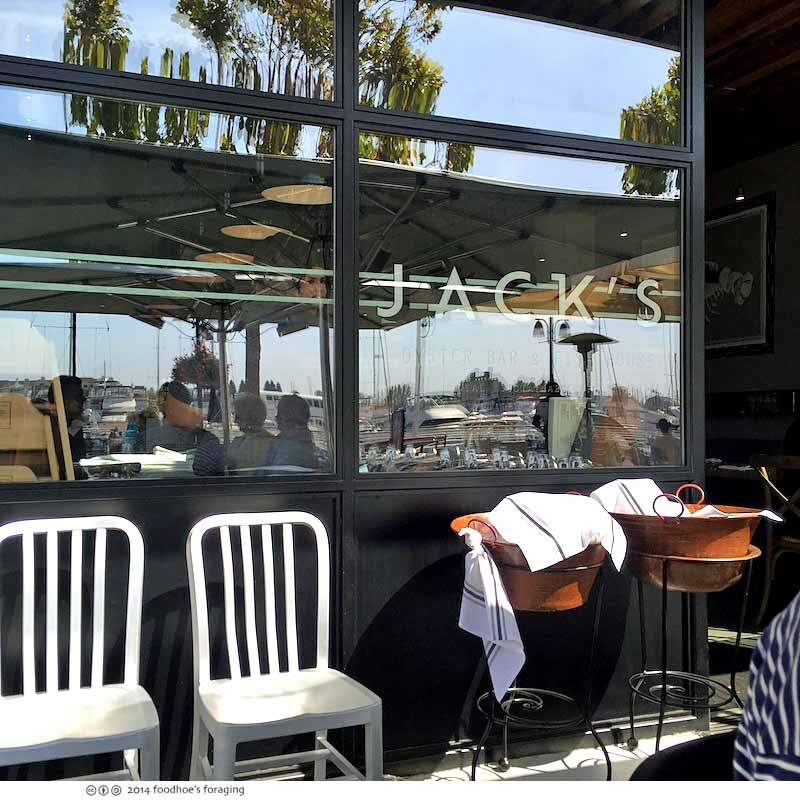 Mr. K and I celebrated his birthday last week with a delicious and enjoyable seafood feast at Jack’s Oyster Bar in Jack London Square. 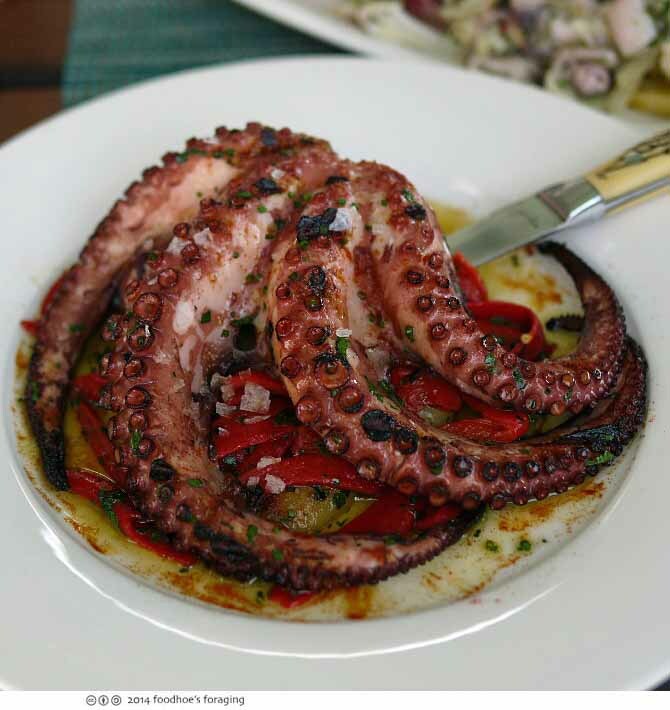 I was so excited when we heard that the owners of Bocanova were opening a new seafood restaurant in Jack London Square. You know I love the squishies from the sea. 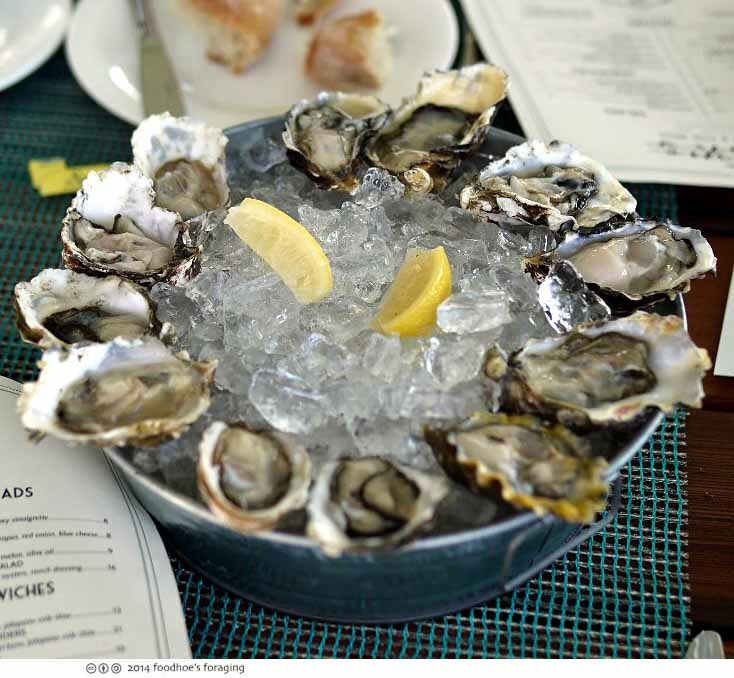 The raw bar features a variety of oysters, clams, mussels, peel-and-eat shrimp and chilled lobster, and an array of dishes including crudos, ceviches, salads, sandwiches, and entrees. 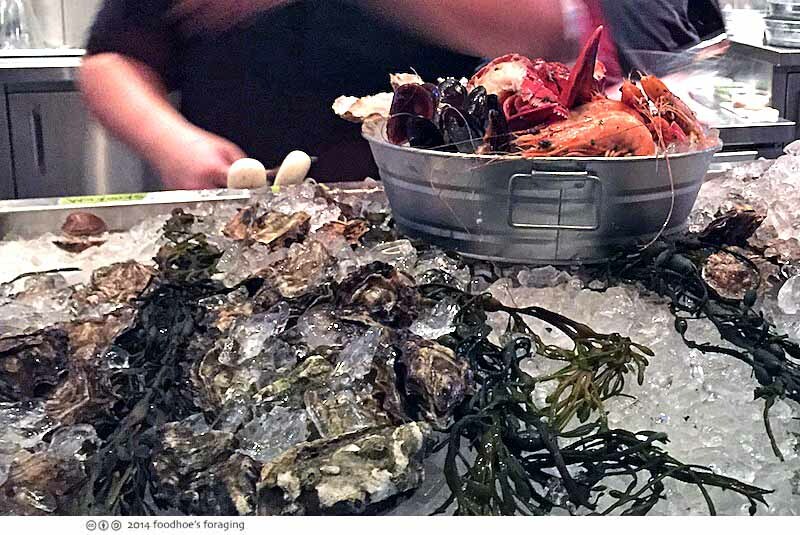 Checkout the Seafood Bucket filled with oysters, clams, mussels, shrimp and lobster. It is right next door to Bocanova, sharing the same awesome view, the same restrooms and even the pastry chef. The beverage program features a full bar serving handcrafted cocktails, a selection of local wine and beer on tap, as well as bottled sparkling wines from all over the world. The interior is casually elegant and cozy, since it was dark out and a bit chilly we opted to eat inside. I loved the seafood themed artwork which was painted on the walls. 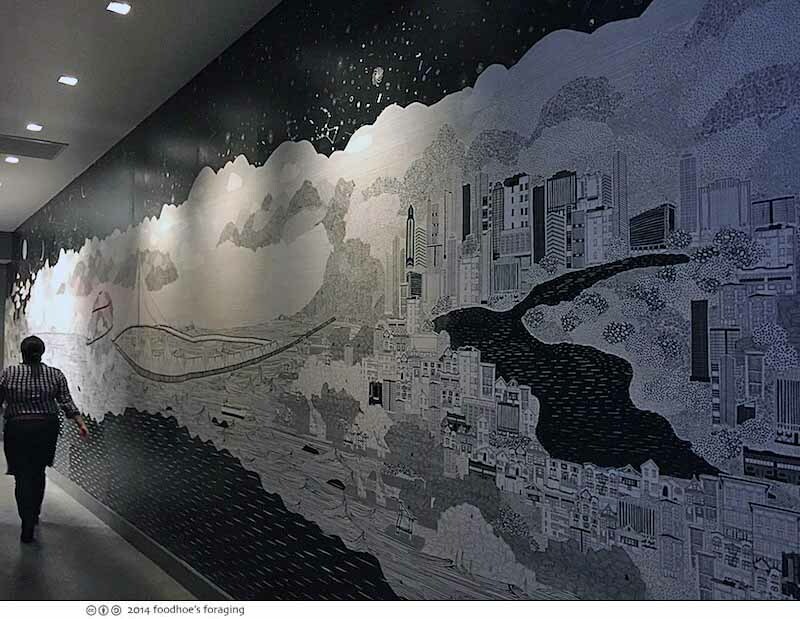 On the back wall along the kitchen is a wheat-paste mural, created by Oakland designers Becky Carter and Michael de La Torre, with textured layers depicting sea creatures, constellations, and the respective Oakland-SF cityscapes connected by the bay bridge. 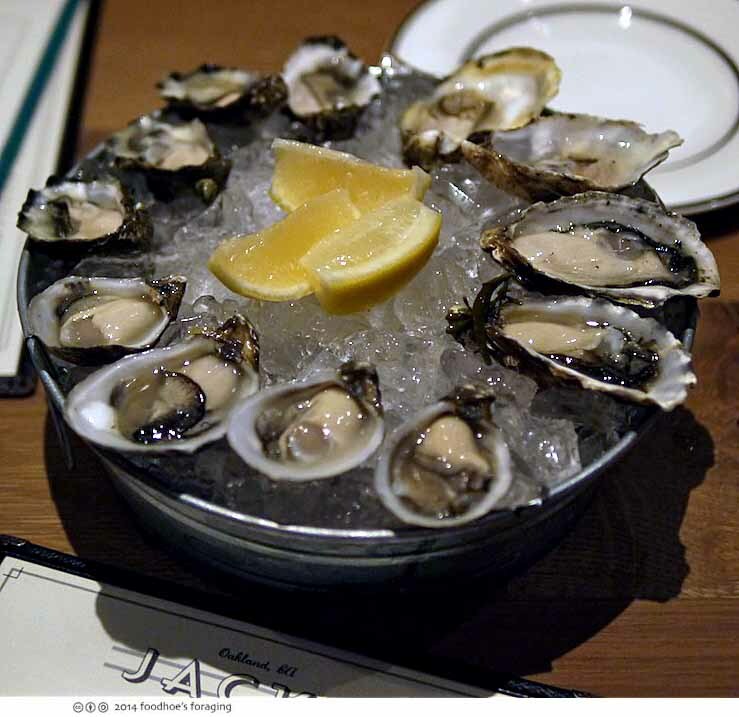 We began with oysters, we asked our server to make a selection of her favorites, and were introduced to our new favorite, the Shigoku (the four very round shells in between 6 and 9 o’clock). 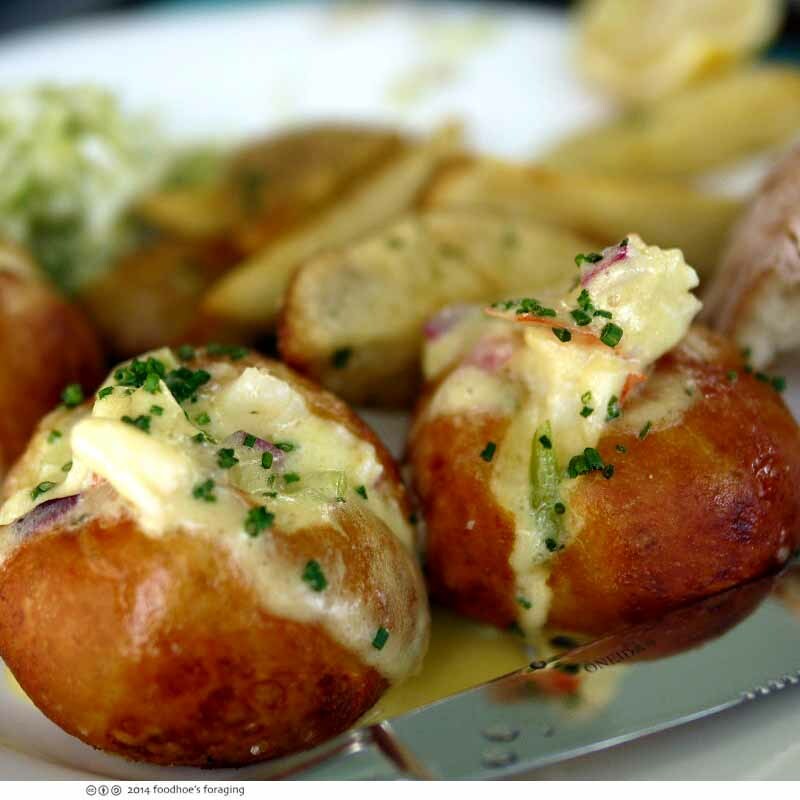 Meaty and bright are words that come to mind, you must try these if you see them on the menu! These were served with a trio of sauces: a classic mignonette (red wine vinegar, shallots and cracked black pepper), a spicy cocktail sauce with wasabi, and an incendiary orange sauce made with habanero peppers. Mr. K liked the heat from that sauce in particular. 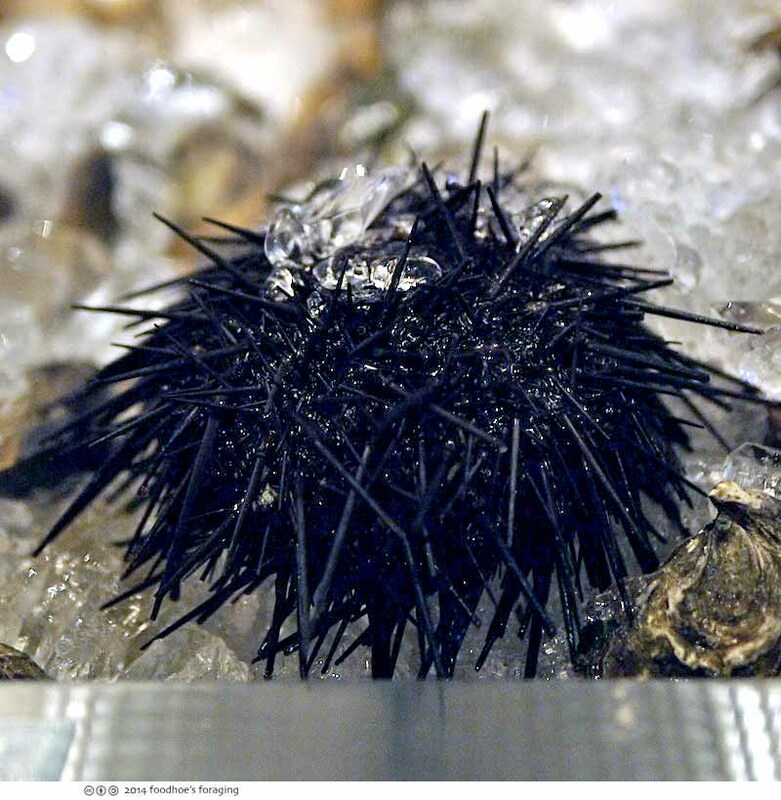 I noticed on their Instagram feed that they had fresh sea urchin, and managed to get the last order available. A beauty isn’t it? And this is what we were served. 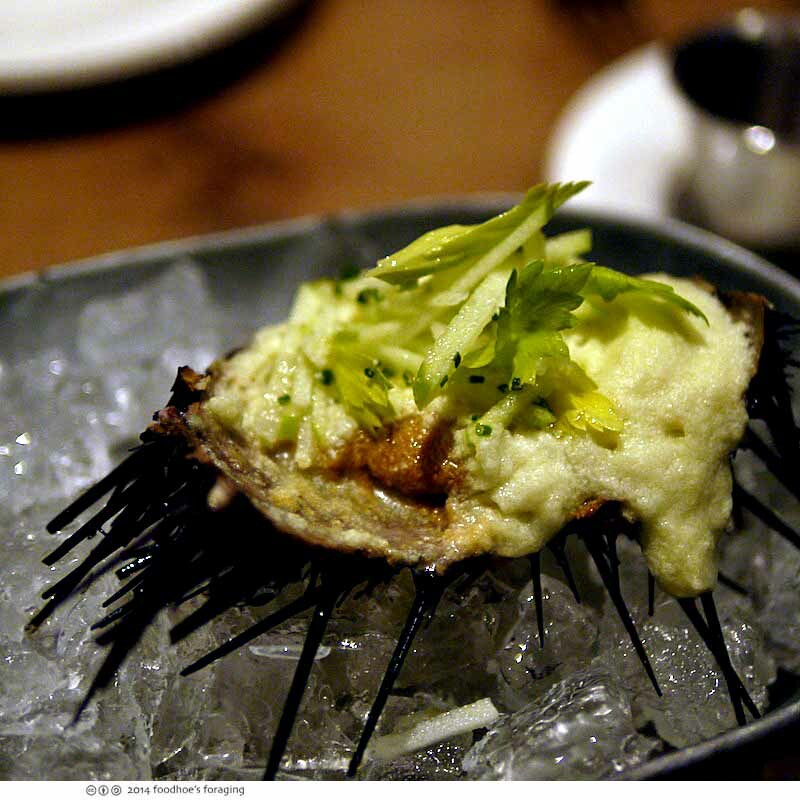 Fresh live urchin ($26) covered in green apple celery goop. And we could only find two pieces under all that mess and it was very bitter. 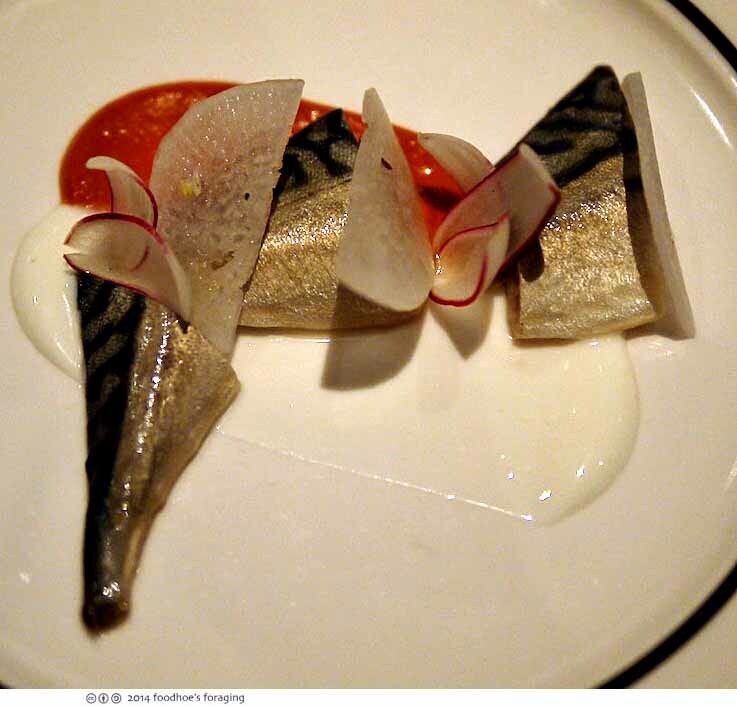 photo from Yelp.com posted by Joanne D.
We loved the Pickled mackerel with red curry, yogurt and daikon radish, it was an intensely flavorful dish, an exciting merging of the flavors of Japanese (pickled mackerel and the daikon) and Indian (curry and yogurt) cuisine. 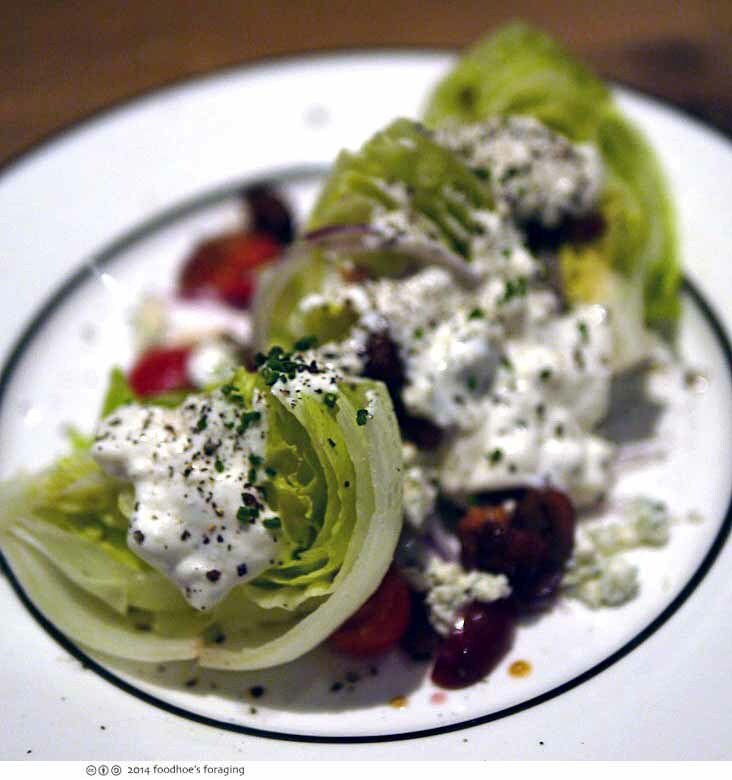 A refreshing iceberg salad with bacon, tomatoes, grapes, red onion and blue cheese. Tasty and on the small side. 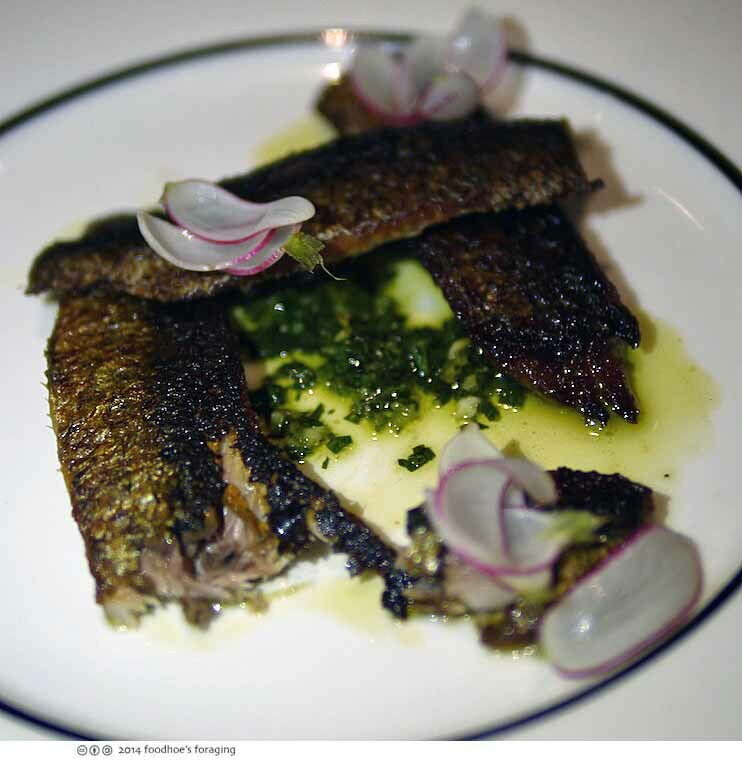 The Baked sardines with radish and salsa verde ($12) were dry and full of tiny bones. 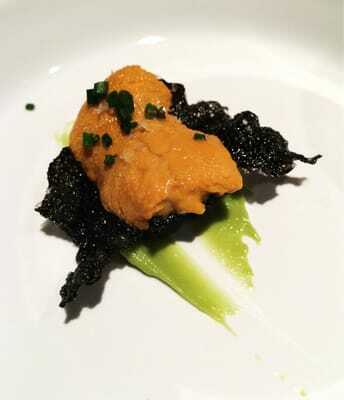 We liked the flavors but not the textures and were glad this was served alongside the chowder. 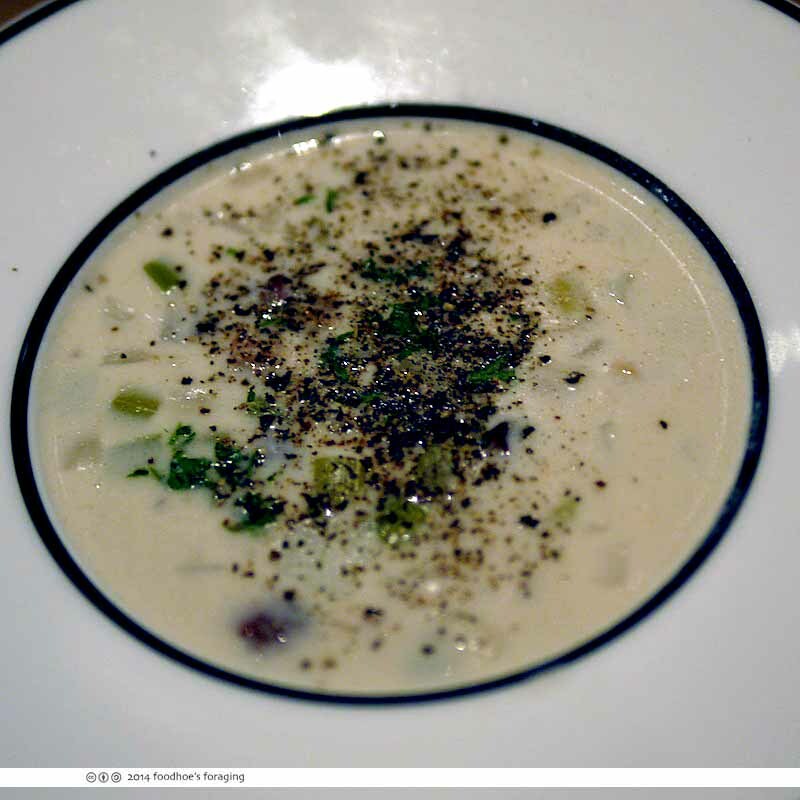 Clam chowder ($9) with bacon, smoked potato, thyme, was richly flavored with a light texture and all of the vegetables were fresh and still had their original textures and flavors. We were stuffed, but had to soldier on with dessert since it was Mr. K’s birthday! 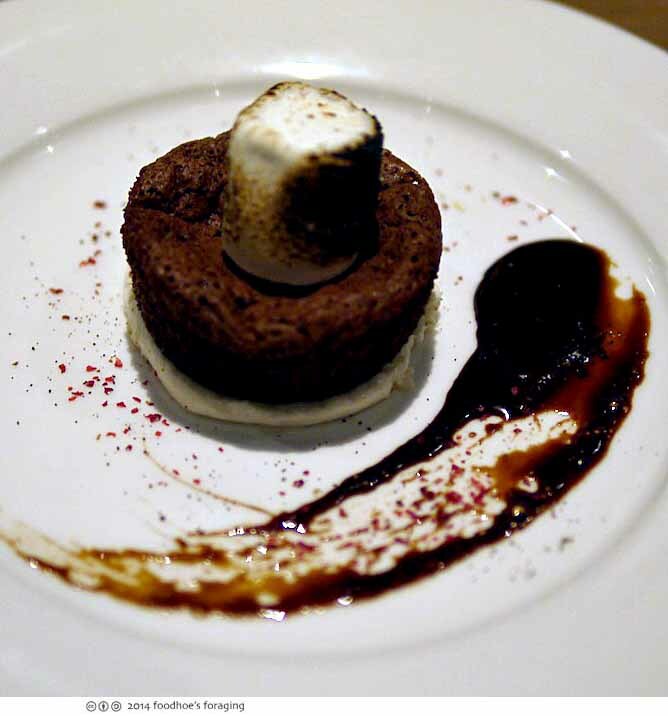 Chocolate malted fudge cake with caramelized marshmallow, sans bananas ($8). Small and intense but yummy, I loved the toasted marshmallow! 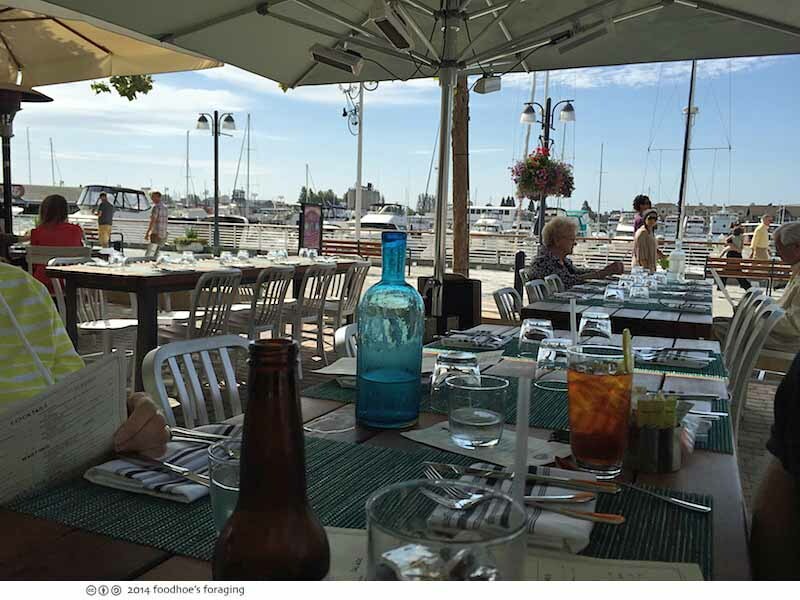 Here are photos of lunch we had last month when Mr. K’s uncle Gus came to visit. We got there early and got to sit at the highly coveted patio, which I highly recommend – the view is uplifting. Seafood Salad ($15) with crab, shrimp, sea snails, calamari, beets, pickled tomato, brown garlic, lemon, olive oil. This was beautifully presented and delicious, everything was tender and flavorful and tasted very good mixed with the thin slices of fresh vegetables in the light lemony dressing. 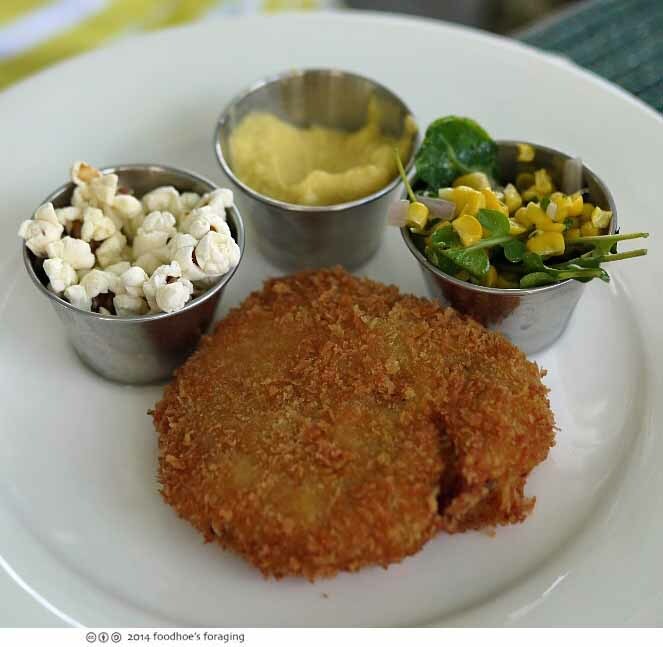 Dungeness Crab Cake ($14) was served with a delicious sweet corn puree, a small fresh corn salad, and a little bit of popcorn. A fun and delicious presentation. I had to order the Lobster Poutine ($15), which was crazy decadence in a bowl. 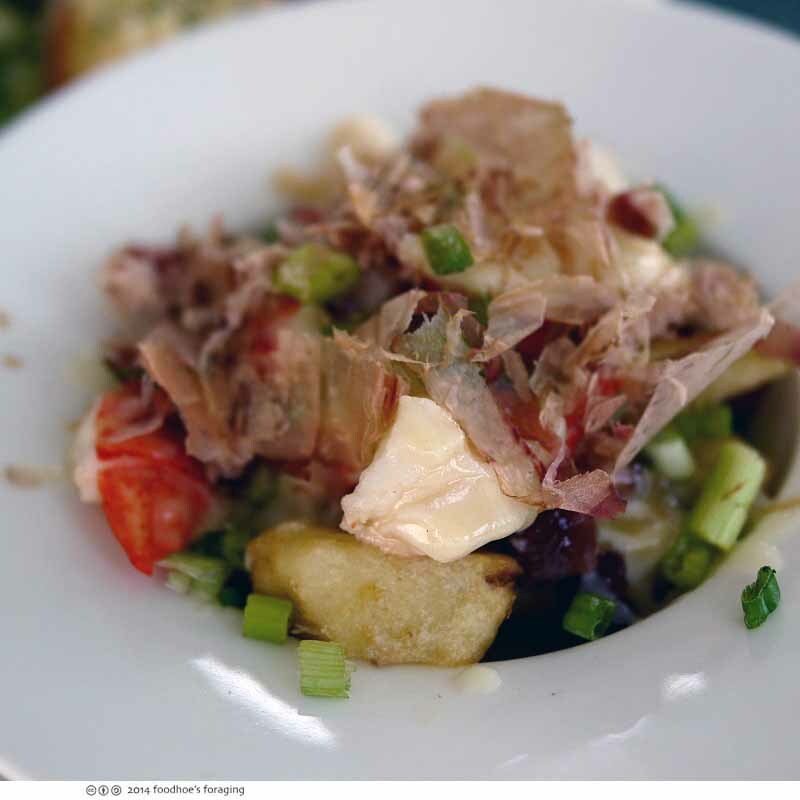 Gorgeous steak cut fries topped with chunks of lobster, bacon, scallions and mornay sauce sprinkled with ethereal shavings of dried bonito fish and sliced green onion. It’s like Okonomiyaki poutine! Casey and Gus each ordered the Maine Lobster Sliders ($21), which were served in housemade pretzel rolls and served with their excellent fries and a small bit of creamy jalapeno slaw. 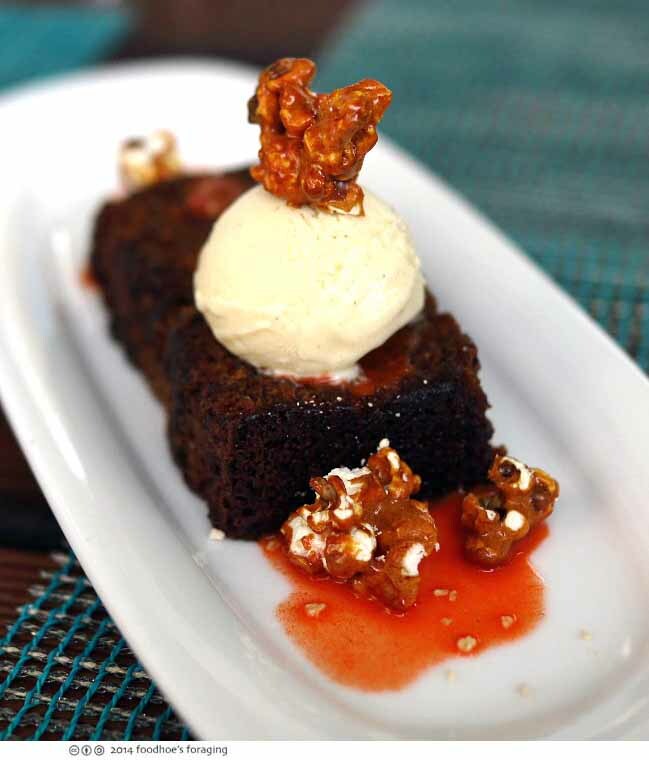 I couldn’t resist ordering the Carrot Cake with Caramel Corn and popcorn ice cream ($8) for dessert. 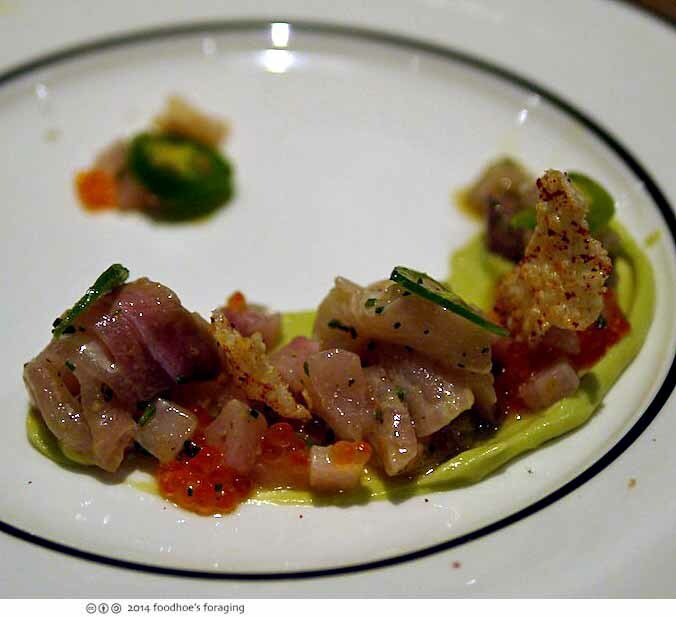 It was fun to eat and had such interesting flavors. I think I prefer lunch outside because it’s just so magical in the sun (and you can get the oyster of the day until 6 pm)! 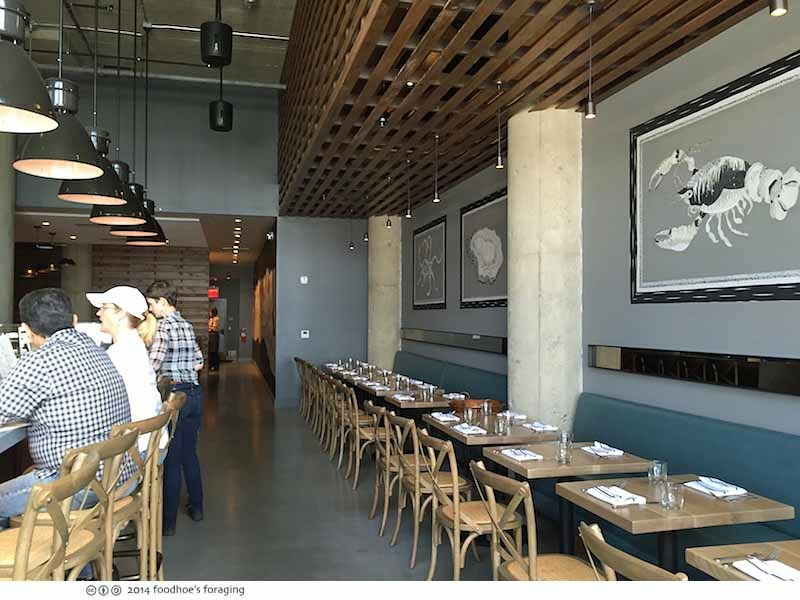 The entire Jack London Square complex has finally turned the corner with enough new restaurant occupancy that it was positively bustling last Friday night! 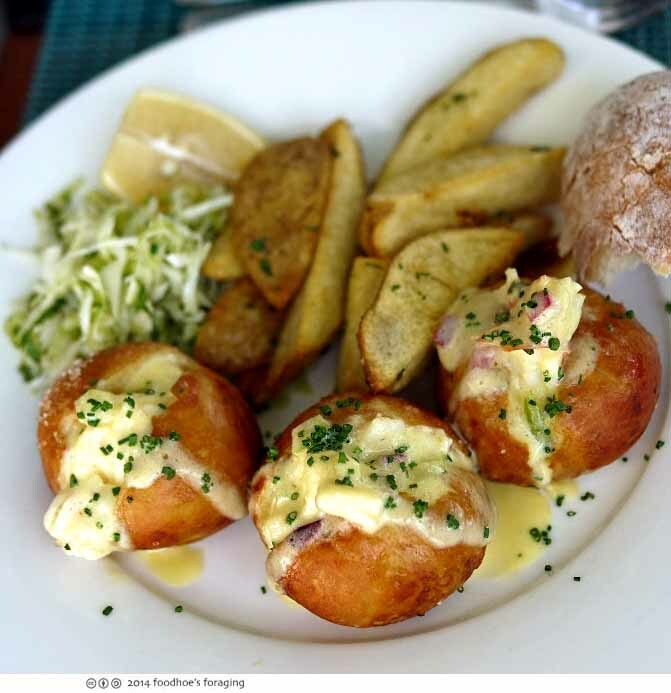 For literally the past decade, we have watched the slow transition from ho-hum old-school chain restaurants (Tony Romas, TGIFridays, El Torito, Old Spaghetti Factory) to new and mostly local restaurants with exciting menus that feature local products and amazing talent in the kitchen (Lungomare, Forge Pizza, Haven, Bocanova, Miette’s Patisserie, the Plank and Jacks Oyster Bar). There is a festive party atmosphere in the air and people were out having a good time. Happy birthday to Mr. K! Thank you for this most helpful post – I have a Groupon I’m dying to spend. Looks like I’m getting that lobster poutine! Excellent, I’m going to try for that discount! Super cool!